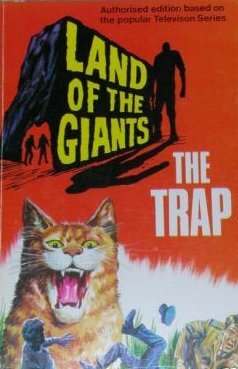 A 1969 paperback novel titled, "The Trap!" A series of novels written by Murray Leinster issued by Pyramid with the original selling price of .60 cents. Supersonic Flight 703, Los Angeles - London, had made an emergency landing in unknown territory, and the passengers and crew stared in horror at the monstrous world around them. One of the most incredible adventures of all time is underway, as the seven castaways of Flight 703 face the shattering fact that they are prisoners in THE LAND OF THE GIANTS.